Jordan, our digital marketing coordinator, has a passion for good eats. And as a former football player, he sure knows how to chow down on lots of grub! So who better to tell you about some of Hamilton County&apos;s unique dishes and eating challenges? Read on to find out "What will Jordan eat?" For my first Jordan&apos;s Eats of 2015, I wanted to try something totally new and different. 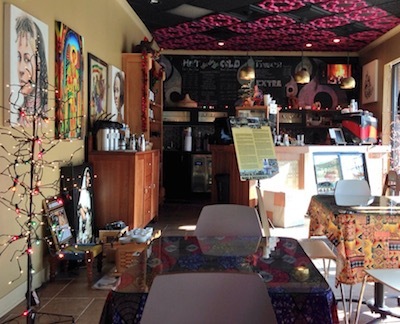 Enter: St. Yared Ethiopian Cuisine & Coffeehaus in Fishers. This little eatery is tucked away on Fall Creek Road right by Geist Reservoir. There&apos;s a full bar, lunch and dinner menus, plus a full service coffee shop inside. Upon entering, I was greeted with bright colors and patterns and lots of Ethiopian art that served to set the mood for the meal. The menu offered up some great lunch specials and a very useful section about the history and tradition behind Ethiopian cuisine. I had never tried Ethiopian food before, but I was in for a treat! To say the least, Ethiopian dining is unique, both in the taste of the food and the way you eat it. The waitress was very helpful in explaining things to newbies, offering suggestions for what to try and helpful hints for how to eat it all. 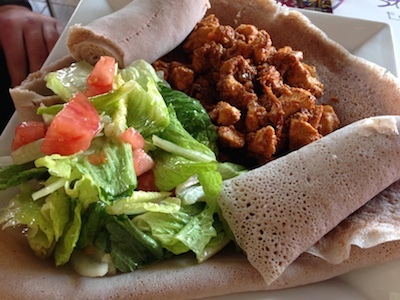 I ordered the Ye-Doro Tibs, which is described on their menu as cubed chicken breast cooked with onions, tomatoes, garlic, ginger, and seasoned with St. Yared&apos;s special Ethiopian seasoning and served with Injera. Injera is a type of spongy bread in the form of a very thin pancake that most of the dishes are served with. Everything else is served on the Injera and you use it to scoop up the other food items, although the waitress was kind enough to offer silverware if I was not comfortable eating with my hands. The chicken was slightly sweet, spicy but not too spicy and had a unique ginger aftertaste. The veggies were served as a salad with a very light dressing. Eating the salad portion with the Injera was a challenge, but one that I took on! My dining companions both tried the St. Yared Ye-doro Mereque (Soup) that they described as slightly spicy and packed with veggies. 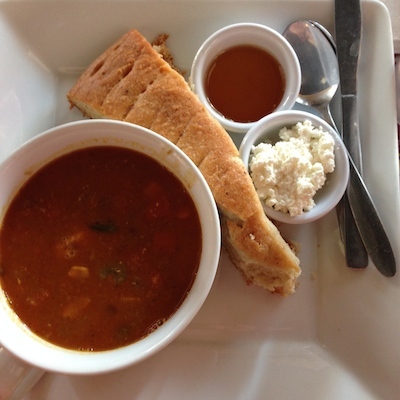 It was served with Ambasha bread, which was much more like a traditional risen wheat bread than the Injera. The bread came with honey and a type of fresh cheese called Ayib. I was lucky enough to sneak a sample of it and boy was it good, especially with the honey and cheese toppings. Overall, it was a great departure from the norm. My favorite part of the eating experience was the Injera bread. The bread itself was tasty and combined with chicken was even better! I will definitely be going back to St. Yared&apos;s for more Ethiopian cuisine and tradition. Next time I&apos;ll try a combination plate so I can sample several meat and vegetarian dishes at once and maybe a traditional coffee on the side. Cheers to trying new things in 2015! Stay tuned for more of Jordan&apos;s Eats! What do YOU think he should try next?